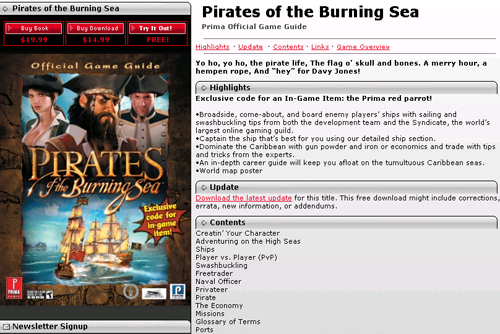 The Syndicate, working again with writer Michael Searle, created a very well received Strategy guide for Prima Games about the MMO Pirates of the Burning Seas. Surging to the top 5 on Amazon.com's best seller list and having very strong e-guide sales even before the paper copy was released, the guide did very well. Flying Labs was very helpful in obtaining the data or in supporting the players working on the strategy and expert content and that helped to make this guide a success. We were definitely very pleased with this guide and proud to have our logo on the cover and on the desks of thousands of gamers across the world.